The story in Castle of Illusion is very generic. 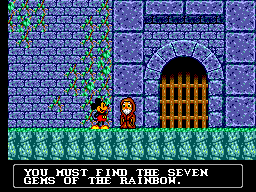 Minnie Mouse has been captured by an evil witch named Mizrabel, and it is your job to rescue her. Beside that you must find 7 Gems which are hidden in the Levels. The Game has two different Modes to Play: Practice and Normal Mode. The Practice mode consists only the first 3 Levels without the Level Bosses. The Normal Mode is the full Game with all 7 Levels. I don't know why they included the Practice Mode, the Game is one of the easier on the Master System and you should have no Problems to Finish it. The only real difficult thing is the Dragon, who is a bit hard to beat. Beside that the Game is really nice, every Level has its own Theme, the level design is great, and there are some great Ideas. The Graphic is great, it looks more like a Game from the Genesis. The character Designs are nice and everything is well drawn. The Backgrounds are really great. They are colorful and especially the Forest and the Castle are awesome. The Sound is nothing spectacular. It fits the Game and every Level has another Theme. For me the best Song is the Theme of the Dragon which sounds really creepy. The sound effects are OK. There is a special sound for everything from dying to getting a new star. The Controls are easy. Button 1 is for taking things like Stones or Cups and Button 2 is for Jumping around. You kill the Enemies either to throw things at them or jump and then press Button 1 while you over the Enemy. You can't change the Buttons, but that is not necessary as the Control layout is great and it is even no Problem to play the Game with the Control Stick. 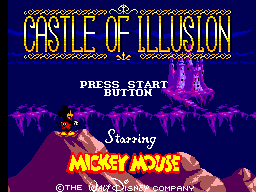 Castle of Illusion is a rather short and straight Game. Normally I would say after beating the Game once, there is no reason to play this Game again, as there are no secret Levels and no Bonus Characters. But the Game is just fun to play and so I put it out every once in a while to play it over and over again. 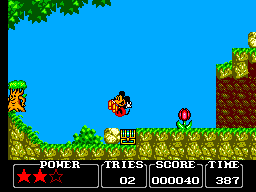 Castle of Illusion is a great Game and I would recommended to everyone who like Jump and Runs and everyone else as it is one of the best Games for the Master System.